Applicants who are in their final year of secondary school and planning to start university in the fall semester (August 2019) must apply and submit all required materials by the regular February 1 application deadline. For eligible students, the Early Decision deadline is November 1. To complete your application, please submit all of the following items to the Office of Admission. Carnegie Mellon University attracts a certain type of student: motivated, inventive, and driven to make a difference. Students come to Carnegie Mellon to learn, create and innovate with the very best. They leave with the passion, connections, credentials and lifelong friends who will help them change the world. What will your day at CMU-Q look like? The application deadline passed for August 2019 entry on February 1st, 2019. Late applications are considered on a case by case basis. Please complete the Late Application Request Form if you would like to be considered. Your writing supplement essay will give us a sense of who you are as a person, beyond your grades and test scores. The statement also demonstrates your ability to organize thoughts and express yourself. The required essay question can be found inside the Common Application, as part of CMU Qatar’s Writing Supplement section. While the writing supplement essay is required, the essay that is included in the common part of the Common Application is not required, but optional for the applicant to submit. All transcripts and official results are submitted by your college counselor, principal or academic advisor through the Common Application. Please invite your school official through the feature inside your CMU Qatar Common App. Your academic transcripts show us your secondary school performance, which is the main factor in our admission decision. We pay close attention to the curriculum rigor and the grades you have earned. The SAT or ACT scores add to our knowledge of your ability. We do not make decisions simply on the basis of test scores; rather, we consider your scores combined with your high school record to evaluate you academically. All applicants, whether transfer or freshman, must submit official SAT or ACT results. Applicants who do not submit official test results will not be considered for admission. Please see the testing schedule for all available SAT and ACT dates. 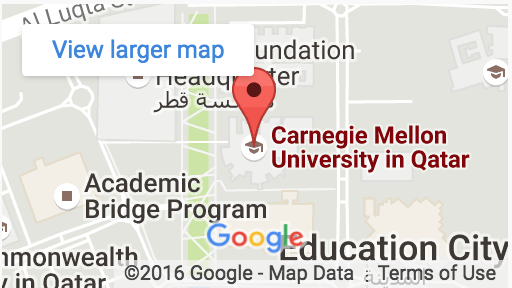 Use code 4246 for official SAT score reports to be sent to Carnegie Mellon Qatar. Separately from our SAT or ACT requirement, SAT Subject Test results (SAT II) are highly recommended but not required. Information Systems: Math I or II, an additional science, a third subject of your choice. Use code 5269 for official ACT score reports to be sent to Carnegie Mellon Qatar. The registration and payment deadline is 10 days prior to test date. You will need to upload a scanned copy of your Qatar ID and passport. The registration cost is $110 USD paid online by credit card. Your registration is not confirmed until payment is made. To demonstrate your proficiency in English, CMU-Q requires applicants to submit official TOEFL or IELTS results. Use code 4246 for TOEFL score reports to be sent to Carnegie Mellon. You can register directly with the British Council office in your country. In Qatar, the British Council office in Doha can be reached at 4425 1888. Please see the testing schedule for testing dates. Students may waive the TOEFL/IELTS requirement if they qualify under our waiver policy. If you have a score of 600 or higher on the SAT Reading and Writing Section OR a score of 26 or higher on both the English and Reading sections of the ACT, you will automatically qualify for a waiver from the TOEFL/IELTS. There is no need to initiate a request for waiver through the Office of Admission. If English is the main/primary language used at home with parents AND the language of instruction at your school, you may send an email to the Office of Admission describing in detail your language background, including languages used at home with parents and the language of instruction from years K through 12 For Option 2, all waiver requests must receive approval from the Director of Admission. The information will be verified with your secondary school. One letter of recommendation from a college counselor, principal, or academic advisor is required. Additionally, one letter of recommendation from a teacher or professor is required. All recommendation letters are submitted by your recommenders through the Common Application. Please invite your recommenders through the feature inside your CMU Qatar Common App. We are looking for information that will help us know you better as a person and as a student. Recommendations from school counselors, advisors, headmasters or teachers provide insight regarding your academic potential and character. A non-refundable $70 USD application fee must be paid online through credit card upon completion of the Common Application. If needed, a fee waiver can be requested inside the Common App. CMU-Q schedules interviews Sunday through Thursday throughout the year, except during February, March and April. As slots in January are limited, we operate an interview waiting list system. If you would like to be considered for a January interview, please therefore submit the interview request form via the link below. We regret that we are not able to accommodate telephone or Skype interview requests from students who are not able to attend an in-person interview in Qatar. If your interview request is declined, please do not assume that your application for admission will also be declined. We are not able to grant all interview requests. Many students are admitted each year without participation in an interview. What about the new SAT writing section? Should I submit a CV or resume with my application? Thinking of applying and want some helpful tips? Why not ask the our expert Jarrod Mock, director of admission, as he answers your most frequently asked questions. At Carnegie Mellon, every applicant is treated as an individual: no single grade, test score, or other factor determines whether a student is admitted. Instead, a complete review of all materials is done for every applicant before a decision is made. This process is known as holistic admission. Does CMU-Q require the new SAT writing section?